06:45: After a lousy night of little sleep due to noisy room neighbors and trains that passed near by we are glad to get up. After having breakfast we head north to Sunset Crater Volcano. This is where we realize how gigantic the power of nature can be. The whole area consists of over 800 volcanoes and all around Sunset Crater Volcano we see the black lave rocks covering the grounds. We take a walk through one of the lava fields and take some very impressive pictures. 18 miles further north we visit the Wupatki Ruins – the left over of a stone house built around 1100 A.D.
From there we aim for Monument Valley. 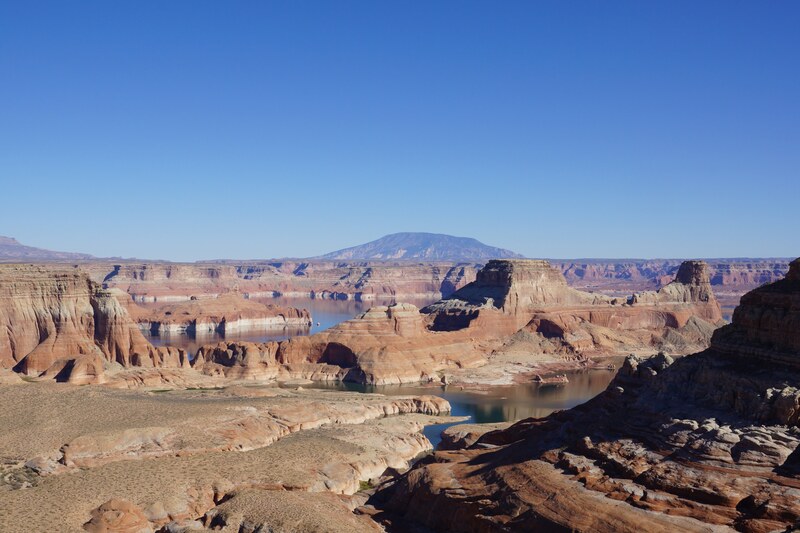 The landscape along the road is changing constantly: Painted Desert, forests as well as moonlike areas are along the way to Kayenta. The weather is making the scenery even more impressive: thunderstorms and lightening as well as beautiful cumulus clouds mixed with sunshine. We are passing a sign announcing old dinosaur tracks. As soon as we get out of the car we are identified as tourist and are immediately approached by an Indian offering to guide us. The foot prints of the dinosaurs are between 20 and 50 cm long and very well visible. He is also showing us petrified vertebrae of a dinosaur which is about 1 meter wide as well as a claw about 15 cm long. Meanwhile it is already 3:00 p.m. We pass the three hotels in Kayenta, hoping to find some lodging possibility closer to Monument Valley. The views are beautiful but unfortunately the batteries of our camera are empty. The only hotel we find in Goulding is way over our budget and camping is not an option because we need power to charge up the batteries. Therefore, drive back the 24 miles to Kayenta to find a place to stay.